We live in an age where the spread of information technology has far outstripped our understanding or control over it. We face the daunting prospect of a reality where privacy is increasingly rare and the technology on which we rely reveals our personal information to everyone from advertisers to governments. Edward Snowden’s disclosures about the depth of information collection by the NSA have made this explicitly clear. 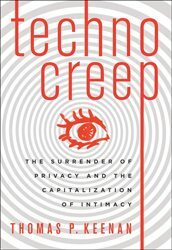 Technocreep is technology expert Thomas P.­ Keenan’s companion guide to life in this brave new world. The title refers both to the creeping insertion of various technologies into an ever-expanding range of modern society and to the creepiness of this technology and its effects. The book covers myriad instances of such techno-pervasiveness, ranging from smartphones as tracking devices to the cyborgization of human and animal bodies to truly eerie advances in robotics. It also explains how quotidian and seemingly innocent actions like shopping online or “liking” posts on social media can have unforeseen consequences. Keenan pulls back the curtain to show us a modernity where privacy, personality, and identity are precarious at best. But while the number of topics Keenan covers is overwhelming in quantity, his analysis is unacceptably superficial. Most of his examples seem to have truly profound implications for how we understand politics and markets, but his examination of these implications borders on non-existent. Instead, he returns over and over to mundane issues like being caught cheating on a partner or having racy photos uncovered. Given Snowden’s revelations and recent scandals about information control involving giants like Google and Facebook, it seems we should have bigger worries. And, while Keenan ends his book with a how-to guide for protecting oneself from prying technology, his suggestions rely more on individual expertise and increasing engagement than on more robust forms of pro-privacy politics. In the end, Keenan’s book gives readers little they could not find with a few internet searches. Readers will come away having sifted through troves of data but somehow not feeling any more informed.